haya droga. TBP a bay cu tur esaki, pero tambe un laptop, riba cual lo tin tur informacion di suministro di droga na Aruba. Esaki kier men, cu por bay spera mas entrada hudicial na otro centronan di distribucion rond Aruba. A confisca tambe varios celular. Kier men, un bon trabao sin duda algun di e team aki, TBP. Nos felicitacion y sigui asina, pa pueblo haya confianza cu nos tin hendenan cu sigur ta sigui lucha contra di trafico di droga. 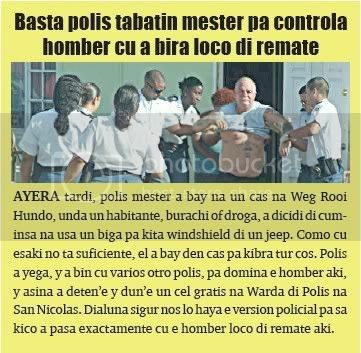 Ayera tardi, polis mester a bay na un cas na Weg Rooi Hundo, unda un habitante, burachi of droga, a dicidi di cuminsa na usa un biga pa kita windshield di un jeep. Como cu esaki no ta suficiente, el a bay den cas pa kibra tur cos. Polis a yega, y a bin cu varios otro polis, pa domina e homber aki, y asina a deten’e y dun’e un cel gratis na Warda di Polis na San Nicolas. Dialuna sigur nos lo haya e version policial pa sa kico a pasa exactamente cu e homber loco di remate aki. (texasmom note) From what I could tell in a later article I believe the man's problem was alcohol related. dang, it looks like urine loaned that guy his shirt. Ladronisia riba beach ta ataca turista stranD-Politie a bay diasabra 2 biaha pa atende asunto di ladronisia riba beach contra turistanan, unda ladronnan ta horta nan tas. tas. E biaha aki, nan a coy un tas, mientras cu e turistanan a bay un rato n’e poolbar. Den e tas tabatin renchi, yabi di kamber y estuche di sigaria. E caso ta den investigacion. 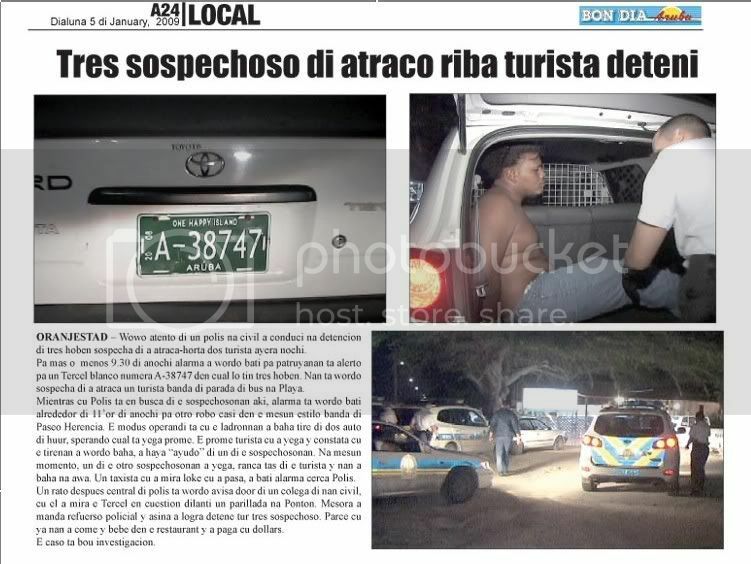 ladronisia on beach is ataca tourist strand-politie owing to bay saturday 2 trip for atende asunto of ladronisia on beach contra turistanan, where ladronnan is steal they bag. the first was at one at where one tourist owing to bay swim y owing to let the bag bao of one palapa. hour cu past owing to go back they owing to bay cu the bag, but after tog one bewaker owing to succeed haye in sweep of dirt. past owing to achieve his tarhetanan in dje y also key of bedroom, but cosnan as holoshi y coin, owing to disparce. at one another highrise hotel, police owing to go back bay for one ladronisia of bag. the trip here, they owing to coy one bag, while cu the turistanan owing to bay one rato n’e poolbar. in the bag had ring, key of bedroom y estuche of sigaria. the caso is in investigacion. sta. cruz --asistencia of police owing to wordo ask diarazon for one cuarto for three of marduga, at one highrise hotel, for one caso of ladronicia. at arrival police owing to talk cu the tourist venezolano of 39 year, or.a.a.l., that owing to declara cu el’a arrive his bedroom for 1:30 of marduga y door cu the was cansa, el’a stick dream at once. el’a tell cu el’a hear one sound y hour cu el’a arise for of dream, el’a see one man color dark bold in his bedroom. el’a give descripcion completo of he cu is measure more or less 1.70 y cu cabey black cortico. el’a tell cu he is dress cu one t-shirt camouflahe berde y one short color dark y leg abao. el’a tell polisnan cu el’a bark y he owing to core bay in direccion of lama. 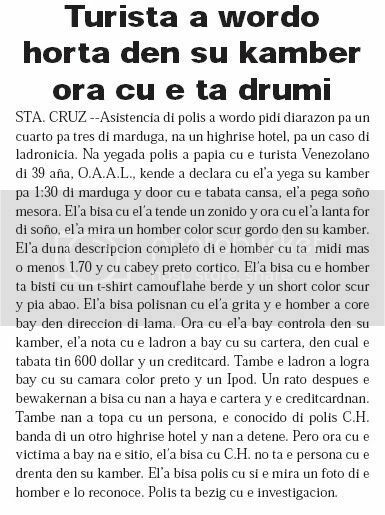 hour cu el’a bay controla in his bedroom, el’a notice cu the thief owing to bay cu his cartera, in cual the was have 600 dollar y one creditcard. also the thief owing to succeed bay cu his camara color black y one ipod. one rato after the bewakernan owing to tell cu they owing to achieve the cartera y the creditcardnan. also they owing to come across cu one person, the conocido of police c.h. near of one another highrise hotel y they owing to detene. but hour cu the victima owing to bay at the sitio, el’a tell cu c.h. do not the person cu the enter in his bedroom. el’a tell police cu if the see one photograph of he the will reconoce. police is bezig cu the investigacion. guardia y tourist is as thief in bedroom of hotel presencia of police owing to wordo ask diahuebs afternoon for 12.30 in one hotel, where the tourist j.k. owing to enter y owing to come across cu one thief in his bedroom. police is bay n’e sitio y they're talk cu the personal of the hotel, that is tell cu he j.k. naci at the netherlands of 24 year owing to enter his bedroom of hotel y for his surprise is come across cu he j.a.p. naci at aruba of 25 year in his bedroom. at once j.k. owing to reacciona y owing to puntre kico the is haci in the bedroom, past owing to tell cu past owing to witch of bedroom y owing to enter in bedroom left, but by of his spanto, past owing to place one i-pot cu past steal bek come across. at once tanto the guardia of hotel, because; j.k. owing to as come across, y owing to entregu’e at personal of visibility team cu owing to arrive n’e sitio. Buckeye posted this in the Natalee thread 12/23/2008. I can never find the Murder and Crime Thread..sorry. SAN NICOLAS - A 46-year-old American tourist is Friday night in San Nicolas, near a bar in the B. Van Veen Zeppenfeldtstraat, robbed by strangers. This is his wallet, with money and credit cards, taken by the thieves. The tourist was injured during the robbery and was taken to hospital for treatment. The victim was one, also American, a friend in the evening 'Chocolate City' go steps. During the trip at some point split up to individual bars to visit. When the time later a woman came out, she saw her friend on street. He was currently unconscious and bleeding from his mouth. When he once appeared conscious that he was a cut on his lip, but the victim could not remember the incident. He knew the police have to tell that his wallet containing $ 200 in cash and two credit cards, had disappeared. The injured tourists were removed by ambulance for medical monitoring and treatment. 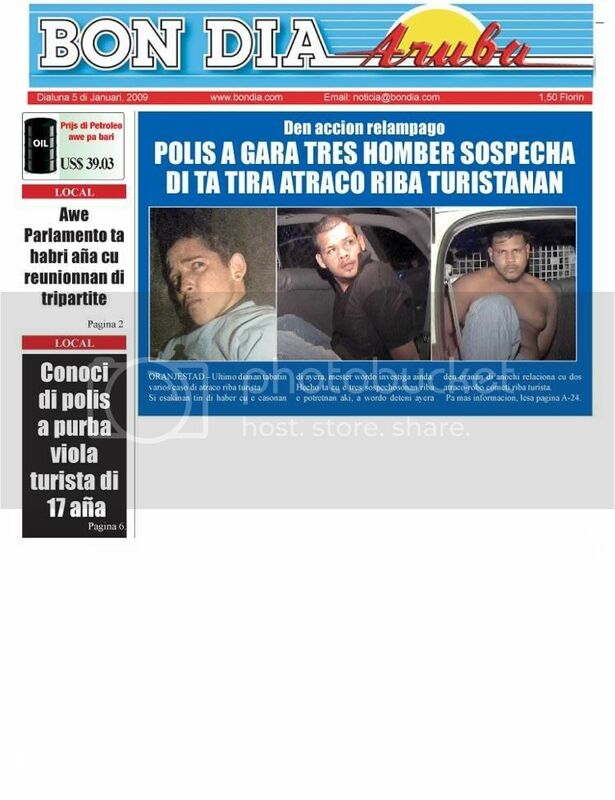 a listr’e na su curpa, y despues a detene. Den prome instante a ser bisa, cu el a corta e turista cu cuchiu cu polis no a haya na su curpa. Nan a ser’e pa buracheria, como cu e tabata basta bao di influencia di alcohol, y despues lo sigui cu e investigacion di maltrato aki. Sigur A.J.M. no ta un bon embahador pa Aruba, pero mas bien un mal propaganda. 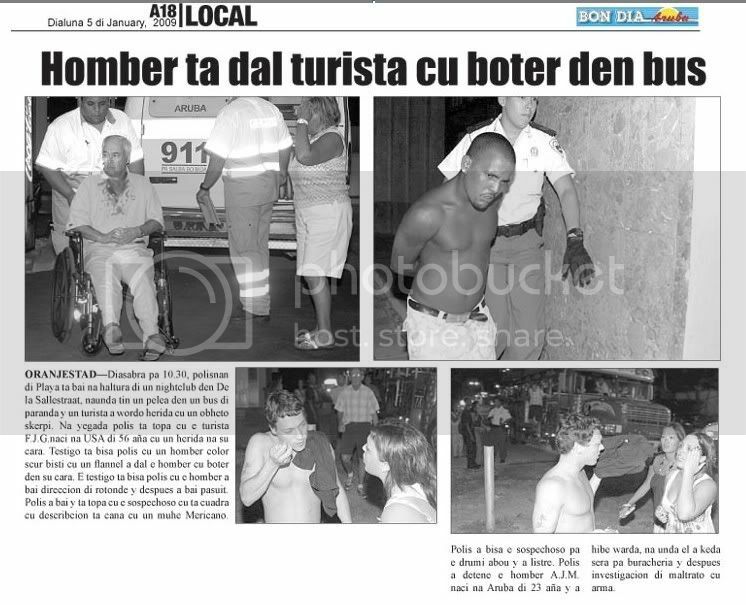 More than one instance of assault of tourist on Buses! ORANGE CITY - Three young men were last night arrested by police in connection with a number of attacks on tourists. The trio went to work by the tires of rental cars blank shots, and then the driver 'help' to offer. If they succeeded to the victims of their valuables to rob. Around half past nine at night the police received a report of a robbery in which at the central bus stop in Orange City would be committed. According to the reporter, there are three robbers involved, which in a white car had gone off. The police got from the reporter, the registration number. Then the security authorities in a search immediately for a half hour later a report of a robbery to get in, using the same modus operandi, now at Paseo Herencia mall in Palm Beach. On the spot police said the victim, a tourist. This stated that, upon arrival at the rental car, the tires found empty. A young man approached her to offer his help. Two others caught without it doorhad when her bag off. Then there is the three went off running. A taxi driver who saw what happened, warned the police, but the thieves were gone when officers arrived on the spot. thief is try enter in bedroom of tourist tuesday for 2.30 of madruga, asistencia of police owing to wordo ask at one highrise hotel, where one tourist owing to achieve one man stop in his balcon. n’e sitio police is talk cu the tourist muher owing to.a.naci at u.s.a. of 23 year, that is tell police cu past owing to see one man stop in his balcon, hour cu the was sit is see television. by cu the tourist owing to bark he owing to spanta y owing to core bay. but past tourist owing to give polisnan descripcion of he cu is color dark, cabey largo rastra. according the tourist is of 3 trip end the week here, cu he is come stop in his balcon. the is tell also cu past owing to lose one laptop in his bedroom. n’e instant ey, not had not had personal of seguridad at keep trahando n’e hotel. tourist canando on caya owing to stay atraca y maltrata police of beach is bay cu urgencia at height of activa trading on lloyd smith blvd, where one muher tourist owing to wordo atraca y maltrata. 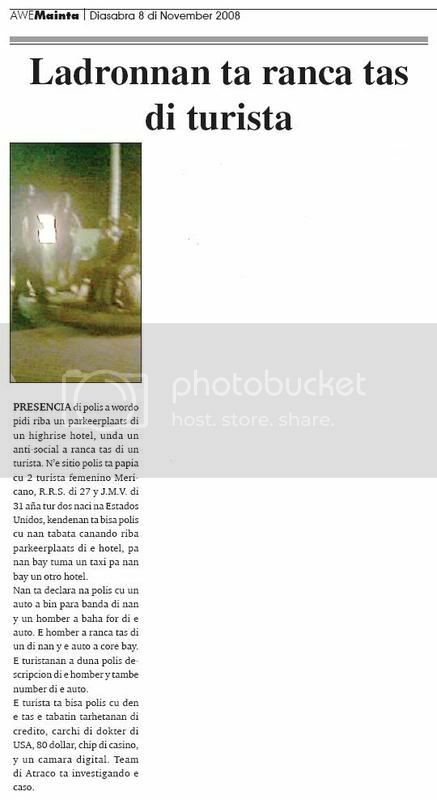 n’e sitio, police do not come across cu the victima, but they owing to achieve informacion cu past owing to achieve one lift cu owing to bahe at his hotel. police owing to bay at one lowrise hotel, where the tourist is stay y eynan police is talk cu the madam owing to.e, naci at estados unidos of 47 year, that owing to tell police past owing to bay cumpra algo at wendy’s, y hour cu the was biniendo bek, one man desconoci owing to come y owing to puntre for one sigaria, but at once past owing to try ranca his bag. the madam owing to as the bag much duro y the resisti, but the anti-social owing to push the poor madam y owing to bente bao. still the victima owing to stay cu his bag teni, but he cu does not bay hand bashi, owing to cuminsa skop the poor victima in his back y his cabes y owing to succeed ranca the bag y core bay cune. 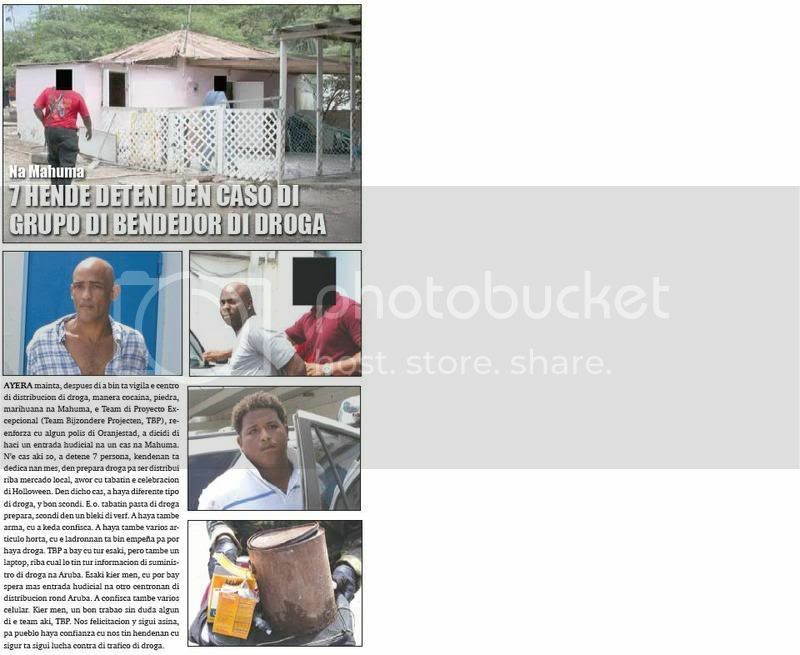 police owing to hibe the victima poli for tratamento y morning the will bay give complaint of the bad experiencia y malpropaganda cu past owing to happen in y achieve of aruba. 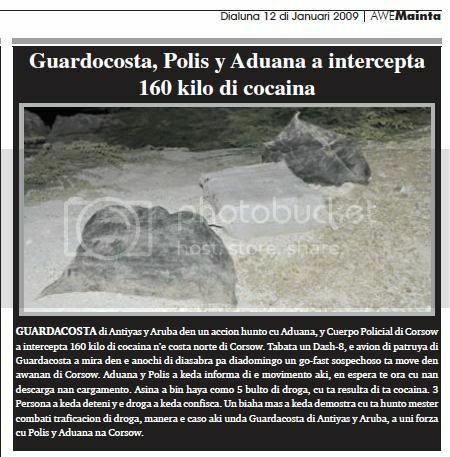 guardacosta of antiyas y aruba in one accion together cu aduana, y cuerpo policial of corsow owing to intercepta 160 kilo of cocaina n’e costa norte of corsow. was one dash-8, the plane of patrol of guardacosta owing to see in the night of saturday for diadomingo one go-fast sospechoso is actuate in awanan of corsow. aduana y police owing to stay informa of the movimento here, provided that espera till hour cu they descarga they cargamento. so owing to come achieve because; 5 bulto of drugs, cu is resulta of is cocaina. 3 person owing to stay deteni y the drugs owing to stay confisca. once more owing to stay demostra cu is together have to combati traficacion of drugs, as the caso here where guardacosta of antiyas y aruba, owing to uni forza cu police y aduana at corsow. 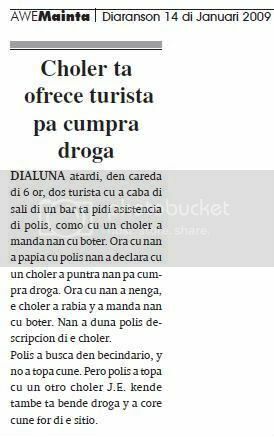 choler is ofrece tourist for cumpra drugs monday nightfall, in careda of 6 or, two tourist cu owing to end of leave of one bar is ask asistencia of police, because; cu one choler owing to send they cu boter. hour cu they owing to talk cu police they owing to declara cu one choler owing to ask about they for cumpra drugs. hour cu they owing to deny, the choler owing to angry y owing to send they cu boter. they owing to give police descripcion of the choler. police owing to busca in becindario, y not owing to come across cune. but police owing to come across cu one another choler j.e. that also is sell drugs y owing to core cune for of the sitio. again ladronnan is enter in bedroom of hotel presencia of strand-politie owing to wordo ask monday 9’or of night, at one highrise hotel, where one tourist owing to achieve two man desconoci in his bedroom. n’e sitio police is talk cu one tourist muher of 40 year, that is tell police cu hour cu past owing to enter in his bedroom past owing to come across cu two man desconoci dress at black in his bedroom. hour cu they owing to mire, they owing to fly for of the window of three floor y disparce. they owing to bay cu one laptop y one i-phone cu they owing to let cay on vlur. the tourist owing to tell police cu past owing to see one his cara good very well. past owing to tell cu they owing to bay cu 300 dollar y also one another i-phone. the caso is in investigacion. will give boet of immediate at all esnan cu stay deteni ministerio publico is sostene zero tolerancia of polis: abort for achieve cu satisfaccion ministerio publico did take notice of the mature cu the cantidad of incidente caminda owing to comete hechonan castigable, owing to stay limita during fakkeloptocht. ministerio publico is haci one call at comunidad for follow in the liñea here y for not spite the gladness of carnaval cu destruccionnan, violencia y another comportacion inaceptable. for promove one carnaval exitoso, police owing to anuncia end the maneho of zero tolerancia. ministerio publico owing to dicidi for sostene the zero tolerancia of police cu his own maneho abort do you achieve (“lik op stuk-beleid”). esey wanted mean cu everybody cu wordo deteni for delitonan simple during carnaval, will achieve one boet self hour. if the boet here wordo pay, then the caso will stay termina. if the not wordo pay, then the person will achieve one citacion for her tratamento of 2 of april future. claro cu if person stay without pay the boet, the exigencia of castigo during the tratamento will is more high. if a comete hechonan castigable earnest, then have to as cuenta cu the will wordo deteni y posiblemente stay close. the hour ey can forget numa on participacion at carnaval. 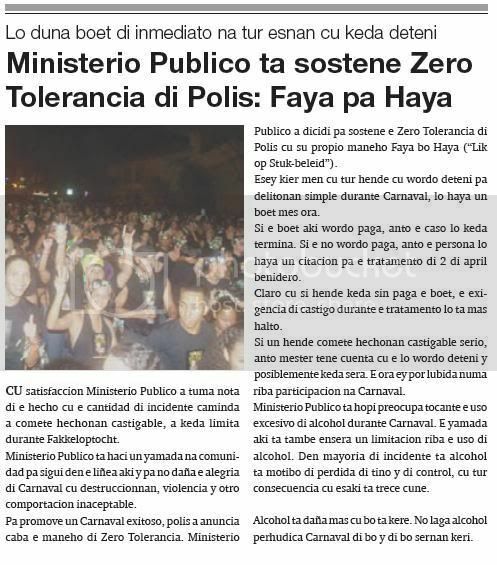 ministerio publico is much preocupa tocante the usage excesivo of alcohol during carnaval. the call here is also ensera one limitacion on the usage of alcohol. in majority of incidente is alcohol is motibo of perdida of tino y of control, cu all consecuencia cu this is trece cune. alcohol is spite more cu are you believe. not let alcohol perhudica carnaval of you y of you sernan keri.